The chair simulator, seen here in full simulation mode. YD Industries is making a daring entry into the exciting world of virtual reality with our revolutionary chair simulator. Our supercomputer executed trillions of mind numbing computations to design a simulated chair so realistic and life-like, it’s practically impossible to tell the difference between it and a real chair. Built of durable Costa Rican teak wood, the chair simulator looks and feels like hundreds of actual chairs. 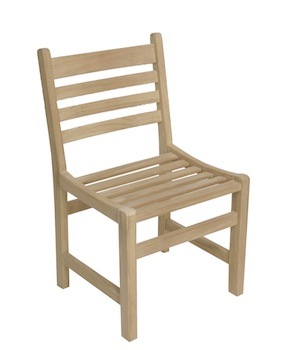 It has a seat, a slotted back, and four durable legs. Sitting in our chair simulator will give you the exact feeling of sitting in hundreds of other real chairs! The chair simulator is ideal for individuals who use chairs in their everyday lives and need the aid of our product to practice their chair technique. Sitting in real chairs is cost prohibitive for many, so our simulator gives a feel of the real thing at a fraction of the cost of an extremely expensive chair. One can sit in the chair simulator, stand on it, place it at a table, on a porch, or even stack books or pets on it. It’s just that chair-like! Please note: The YD Industries Chair Simulator is flammable and should not be placed in barbecue pits.